I remember my dad saving up to buy the black and silver brick of the first iPod Photo. I looked upon it with pure envy and wonder. Whenever I got my hands on it, I would spin my finger around the Clickwheel until the clicks sounded off like a Geiger counter. But of all of the Apple machines that were around, the iPod Nano (the first video one) my parents bought me was the most memorable. I traveled to India and Arizona with it, and watched The Curse of The Black Pearl until I could do a perfect impression of Jack Sparrow. Two weeks ago, I was sitting in the lockeroom at my gym preparing to workout. I was using my iPhone to select a few songs to listen do during my workout, namely some songs from Kendrick Lamar’s DAMN, Travis Scott’s Birds in The Trap Sing McKnight, and Childish Gambino’s “Awaken, my Love!” The week before it may have been a mix of Creedence Clearwater Revival, Arctic Monkeys, and Tame Impala. My music tastes change day-to-day. I seek flavor and attitude within soundscapes, regardless of the genre. My iPhone is a Product(RED) 7 Plus. I bought this to replace my 6, which met it’s demise after sliding off my Wrangler’s dashboard into the parkway, and then getting pancaked by an untold number of cars. I was hesitant to upgrade again (I had jumped from an exploded 4 before the 6.) and was growing wary of increasingly information-hungry, fingerprint-reading, giant-screened pancakes. While I was aiming for the familiar iPhone SE, my mother offered to subsidize the 7 Plus because of the dual cameras being a benefit to my work as a photographer. I can’t turn down a free phone, so I obliged. While sitting on that bench, I found myself intermittently stopping to answer text messages from my college friends and Snapchats from my family. It was with a few upward, dismissive swipes of the banner notifications that I started to have a revelation; Apple’s crusade to simplify the music device has actually made it more complicated. Today, I can’t just pull the device out of my pocket listen to music anymore without being spammed by the reaches of the Internet, Instagram, my friends, my coworkers, Instagram, targeted ads, news, and my own wanderlust. God, I miss my iPod. After the lifting, I headed home and rummaged through my nightstand to find the Nano. The back-plate had come off, and the LCD had absorbed some split Izze at some point. I strapped the plate on with gaffing tape, found the one 30-pin Dock cable in the entire house, and set about charging it. For what felt like a week, I ran around with the pebble-weight iPod, listening to my now-5 year old playlists. Sure, I didn’t have access to stream whatever music I wanted, but I was free to listen, uninterrupted. No internet, no fuss. This was heaven. But I am of Adam, and prone to failure. I made my fatal error at the end of the week. The aforementioned Izze had also made the click wheel a bit stubborn and sticky, so I decided to clean the inside of the iPod as well as the LCD on the inside of the glass. I pulled off the tape and dismantled the iPod in my garage. Not knowing that contact cleaner will eat an LED blacklight, I killed the LCD and nearly broke the ribbon cable for the screen-while the iPod was on. The iPod began to go into boot-loops, and at that point I could only assume that the screen module or my novice tech knowledge had killed something on the Logic Board. I rushed to Amazon and ordered a new click wheel and a new LCD panel, threw the dismantled iPod into a zipblock, and prayed that it would work upon arrival of its new parts. Then I had another idea; Why not treat myself to another iPod, but not just any iPod, an iPod Classic. Why would I buy an iPod Touch, if I already have an iPhone? They’re essentially the same thing, right? Besides, I want something disconnected and unplugged. I had some cash to spare, and so I hit up Amazon, and eBay, and whittled it down the the 2003 iPod. The third-generation iPod Classic with the glass Touch wheel and the four illuminated-buttons. This was design perfection. The third-generation “Dock Connector” iPod was released in April of 2003, the same year ‘Hell Froze Over’ and iTunes debuted on Windows. 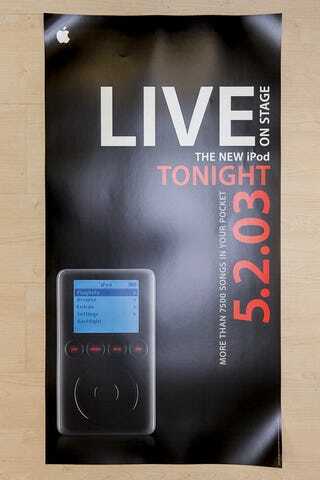 Apple had sold a million iPods, and 10 million songs on iTunes. A gallon of gas was also $1.83, and Keanu was jumping off of trucks on the freeway. Just in case I ended up with a bad egg, or maybe it was the technophile fever that overtook me, but I bought three. “Dwight” A scratched up 10GB from NYC, listed for $10 “found in the back of my closet, no idea if it works” was in fact in working condition, but the seller had no charger to test it with. Came pre-loaded with 50-cent, DMX, and Eminem. “Brandon” A 8.5/10 40GB model with a new battery from just outside of Chicago. Loaded with AC/DC and many other metal bands I’ve never heard of. “Dr. H.A.M.” A pristine, plastic wrapped 30GB with NO SCRATCHES from an OBGYN in California who used it while in medical school at UC Ivine. Dr. Ham is Japanese, as in the music inside the iPod. I quickly learned several things about the third generation iPod. 1) The iPod and its aesthetic are freaking awesome. 2) It doesn’t charge through USB. Not so awesome. While Dr. Ham’s box included an plethora of obsolete accessories, I found that the logic board in these iPod requires the 10-volt charge from a 6-pin FireWire to Dock Connector cable to keep the logic board hot during a reformatting and updating process (to power the harddrive.) After which it then can use the USB 2.0 connection to sync songs all day long, just not charge. Even my geeky MacBook Pro Retina I purchased in spite of the Touch Bar release still needed a Thunderbolt-2 adapter and a FireWire F400 to M800 adapter to connect and charge the iPod, with an odd delay in data relay speeds. After loading my music (which took ages) I was also reminded of another fact of life today. Apple Music is only a license to listen to all of the Music Apple owns (.M4a files.) Not the MP3s/M4as you bought on iTunes, which have no DRMs that require an constant internet connection. In order to listen to the music you’ve gotten through subscription, you either need to re-buy them on iTunes, or use fishy expensive software to convert your iTunes library into good-old MP3 files. All in all, it was magic. The 2-bit monochrome display, the smooth finish and backlit buttons. Everything was simple. No distracting album artwork or pop-up notifications. Just music. Apple Music, in the original sense. So I consulted the Internet. And asked why and how. Except for the occasional RockBox hack and CF-card conversion of iPod Classics, no one has managed to connect any iPod to WiFi. Even via bluetooth data tethering to a smartphone. Nobody’s pulled it off. Sure, it’s impractical for wheeled-iPods. You can’t search or type anything in beyond a certain extent, and even if my sister’s 7th generation nano could connect to WiFi, its potential iOS app-development and purchasing revenue pale in comparison to the iPhone and iPod Touch’s almost indistinguishable digital expandability. If you’re Apple, it totally makes sense. You’re really just producing another iPhone that doesn’t call anyone. Easy. Apple Music gets thousands of more subscribers and you suddenly phase out half of your products hoping no one will notice. But we did. Apple, you made a mistake. If my 19-year old sister also doesn’t want the iPod as we 25-year olds understood it to die, and iPod Classics are still selling for hundreds (sometimes thousands if sealed,) why didn’t you take a risk on us? “We have the technology, we can save him.” Since the iPod got killed, you’ve introduced Touch and FaceID, Thunderbolt-3, Apple Pay, Siri, haptic touch, sapphire glass, and a whole host of other groundbreaking tech that could’ve easily made its way into the true heir to the throne. The iPod Touch is a pretender. You just released an cellular-enabled Apple watch that can supposedly take a call miles from its iPhone host, why can’t you make an iPod that can use an Apple Music subscription? How many times will a person actually search for music in Apple Music once its been added to their library? Why can’t you make a simple iPod that can play with today’s subscription-based music and downloads alike, while not feeling like just another Phone someone can annoyingly send us FaceTime calls too while we’re working out? Why do we need a camera on there anyway? We’ve got three on our phones now, and one on our laptop. In fact, I have a DSLR anyway. But that’s just me. Or is it? We picked up our iPods to submerge ourselves in the emotions and soundscapes that defined our intellectual, mental, professional, and creative journeys. To isolate ourselves from the constant bustle of the future and the Internet and blast Red Hot Chili Peppers over the stereos on long summer drives with our friends to the beach. We can’t do that anymore. We’re connected to infinite amounts of information with no repose. Today, we’re ironically isolated to social media and television on these devices, so much so, its actually separating us from truly enjoying music. The iPod we knew and love can return and still compete and play with Apple’s current lineup. Without being archaic. I was made some sloppy photoshop, but also made a menu-readout for a potential iPod Classic 2 would spark the revolution. It’s possible. Let’s try this, Apple. 15th Anniversary iPod Classic 2, available in 3 colors and (RED,) all with WiFi/Bluetooth AirSync and also available with +Cellular. ($150 or $250) all standard 64GB or 128GB. OLED or Monochrome LCD, you pick. The latter is easier on our eyes. Hell, we’ll forgo the 3.5mm jack get with the lightning program (or USB-C.) Just give us the click/touch wheel, and tweak it and the screen to make it play with the other devices. Give it ‘iPod OS 3.0' And we don’t really need a touch screen. But we can meet in the middle. God that’s an ugly photoshop, but some of y’all can do better. Please, Apple. You know it’ll sell. They’re buying a freaking screen for a watch.